Sinatra was, outside of the world of opera, the greatest singer of the 20th century. As we mark on December 12 the 100th anniversary of his birth, we remember that he was a once-in-a-century talent. Until his later years, he never hit a wrong note. A couple of years ago I attended a talk given by Bill Clinton's former defence secretary, William Cohen. It was held at a Toronto restaurant, and Cohen was introduced by Canada's former prime minister, Brian Mulroney. Among the topics discussed: free trade, China, Iran, nukes, Putin, climate change. There was something to offend everyone, but I wasn't offended until the woman sitting across from me said that Sammy Davis, Jr. was a better singer than Frank Sinatra. Naturally, I assumed she was joking or drunk. I laughed and laughed some more until I realized she wasn't laughing. She also wasn't joking. I tried to give her an out: "You prefer Sammy Davis as an overall entertainer, yes?" That still made no sense to me, as much as I admire Davis and his considerable gifts, but I was desperately trying to understand her comment and ease tensions at our table. No, she said. She insisted -- against all sanity and reason -- that Sammy was the better singer. "Why would I want to listen to Sinatra and another singer when I could listen to just Sinatra?" I began laughing again. How could I not? Stranger still, this woman was a singer who had given a copy of her new CD to my partner. When I told him her view of Sammy vs. Frank, he -- after getting his hysterical laughter under control -- suggested we not bother listening to it. How musical could she be? Sinatra was, outside of the world of opera, the greatest singer of the 20th century. As we mark on December 12 the 100th anniversary of his birth, we remember that he was a once-in-a-century talent. Until his later years, he never hit a wrong note. The phrasing; the breathing (which you almost never hear); the emotion (the evolution of which, as he aged, is reflected in his music); the personality (which would not have been so compelling without its flaws) -- it has all been analyzed and categorized. John Lahr, Pete Hamill, Bill Zehme, Gay Talese, Robert Christgau, Mark Steyn and others have praised and criticized and parsed the man and his music. Sinatra recorded this twice, in 1946 and in 1960 (for his album Ring-a-Ding-Ding). I recommend the second version. It's joyful and confident, and Sinatra's voice is at a better place. How can you not love a song with the following lyric: "A politician's daughter was accused of drinking water, and was fined a great big $50 bill"? And the rest of it is just as witty. This song was introduced in the 1959 Sinatra movie A Hole in the Head. When Sinatra recorded it with a chorus of children that same year it could easily have gone to treacle, but he is adept and utterly un-self-conscious with the lyrics and with his enthusiasm. There is nothing cynical about his delivery. In 1960, the lyrics were re-worked so that Sinatra could record a JFK campaign song. "Everyone is voting for Jack/'Cause he's got what all the rest lack/Everyone wants to back Jack/Jack is on the right track." Sinatra makes this George Harrison song what it should be -- lush and romantic -- rather than weedy and whiny (and I say this as a great fan of Harrison). Sinatra recorded it twice -- in 1970, and a decade later for Trilogy: Past Present Future. The latter is the version to purchase -- mature Sinatra singing a mature love song accompanied by extraordinary orchestration. This song opens and closes with a few beats of "La Marseillaise" and then quickly begins to swing with the help of Nelson Riddle. "If you think I won't find romance in the French Foreign Legion/Think about that uniform with all its charm/So one more time are you going to be mine/or it's au revoir cherie." Sinatra pronounces it "oh ree-voir" which is quite wonderful. I can't imagine even Bobby Darin making it nearly as playful. Yes, this is your children's song with updated lyrics and another Riddle arrangement. If your children are undergrads, this song should come with a trigger warning as it will probably make them feel "unsafe." Sample lyric: "Ol' MacDonald had a farm/E-I-E-I-O/and on this farm there was a chick/the purtiest chick I know/with a little curve here and a little curve there/this chick, she had curves everywhere." Oh, come on! It's fun. I am tempted to add a duet to this list, Sinatra and his daugher Nancy, singing "Something Stupid," or perhaps Sinatra and Sammy Davis, singing "Me and My Shadow." Recorded in 1962, it contains the now bittersweet lyric "closer than Bobby is to JFK." 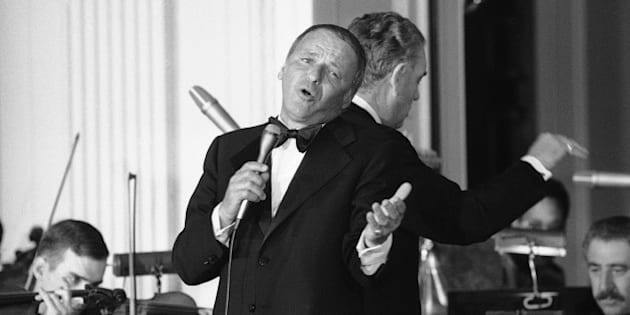 It might make my tablemate from the William Cohen dinner happy, but I can't forget the words of my late brother who once said, regarding the idea of Sinatra singing a duet with anyone, "Why would I want to listen to Sinatra and another singer when I could listen to just Sinatra?"